As a member of the media, I will now attempt to do exactly that. The first point is the most basic: Members of MS-13 are people. Even those affiliated with a transnational gang guilty of gruesome violence. Even those who were born in Central America. Even those who don’t speak English. To forget that is to take a step toward dehumanization and the easy rationalization of so much worse. The second is that the tools the federal government uses to identify and deport supposed gang members are so sloppy that one need not actually be a gang member to be identified as such. When Trump conjures a fearsome image of gang members, he is providing cover for another of his goals: to deport black and Latino immigrants, including those without criminal connections. MS-13 was formed in Los Angeles in the 1980s, and, when the United States deported many of its members back to El Salvador in the 1990s, we seeded the transnational spread of the group. Now the US government is cracking down on immigrants who are escaping a problem we helped start. MS-13, according to a new report released last week by the New York Immigration Coalition, is indeed a brutal group. “MS-13 is a complex phenomenon—a social organization first, and a criminal organization second,” the report reads. The group is “not about generating revenue as much as it is about creating a collective identity that is constructed and reinforced by shared, often criminal experiences, especially acts of violence and expressions of social control.” That has translated to grisly killings; the gang, for instance, often maims their victims with machetes before murdering them. Its violence is largely geared toward members of their own community, mostly of other young people and those suspected of disrespecting the gang. But the Trump administration has made very little distinction between MS-13 members and victims. Often the young people who are targeted for retribution or recruitment are the same young people targeted by law enforcement for their suspected affiliation with the group. With the revival of Operation Community Shield—a program led by Immigration and Customs Enforcement (ICE) that partners with local and federal law enforcement to identify and detain noncitizens who are suspected of being gang members—the Trump administration has been using the pretext of gang crackdowns to engage in racial profiling of blacks and Latinos. The New York Immigration Coalition, which surveyed 43 attorneys, advocates, and community leaders in the New York area, found that more than three-quarters of respondents worked with clients who had been accused of being gang members. But the report also found that law-enforcement agencies, like the New York Police Department and Nassau County Police Department, rely on the flimsiest of criteria to formally label someone a member of a gang. In Nassau County on Long Island, being guilty of any three of the following can get a person labeled a gang member: having tattoos showing gang affiliation, dressing like a gang member, using gang-associated hand signals or symbols, spending time with known gang members, being identified as one by another law-enforcement agency, hanging out at a “gang function,” or owning personal property or clothing associated with gangs. According to Elizabeth Rieser-Murphy of the Legal Aid Society, the government has cited Chicago Bulls paraphernalia, Adidas hard-top shoes, Nike Cortez shoes, plaid shirts, flat-brimmed baseball hats, and even rosary beads as evidence that her clients are in a gang. What’s more, supposed gang affiliation has been used to deny young people forms of relief they may have been otherwise been eligible for, like release from immigrant detention or the approval of immigration visas. While the president spouts hateful blather, the administration operationalizes his worldview. By calling gang members “animals,” he empowers ICE to target all Latino and black people. In his speeches, Trump slides between gang members and immigrants in the same breath, blurring the distinctions between the two. 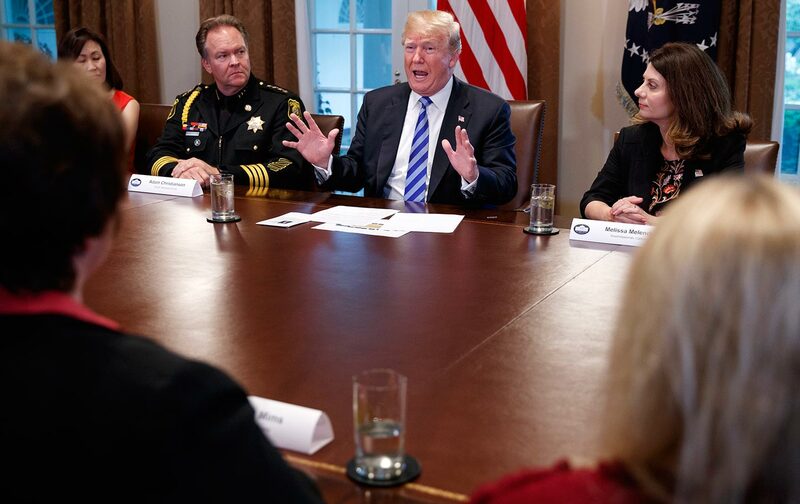 By labeling gang members “animals” and using the crimes of MS-13 to justify a broad crackdown on a larger community, Trump has made it OK for federal law enforcement to see all immigrants as something less than human.